PAUL SIMON AND MARTIN ACOUSTIC GUITARS. Now Paul Simon has been around for a very long time now, and we hope that he'll be around for a while to come too. Very few have ever graced the planet with the triple attack of talent that Paul Simon has, singing, song writing, and absolutely superb guitar playing. That's right - Paul Simon is a top notch guitarist. It's okay if you didn't realize that, you were probably busy singing along to the million and one great Paul Simon tunes out there, be they with or without sometimes singing partner Art Garfunkel, but no matter - Paul Simon plays the guitar very very well in a number of styles and capacities. He's not someone like an Elvis, Johnny Cash, or even aJohn Lennon - Paul Simon really PLAYS the guitar well, he doesn't just sing and strum rhythm along with his singing.Paul Simon is a legend, and so he always plays a Martin acoustic guitar. C.F. Martin & Co. knows a good thing like Simon when they see and hear it, and so they've got more than one Paul Simon signature model guitar available. 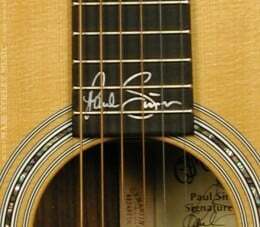 This article will be looking at the second of the Martin Paul Simon signature series guitars. THE MARTIN PS2 - THIS GUITAR IS NO LONGER AVAILABLE. WHAT IS THE MARTIN PS2 GUITAR? The Martin PS2 acoustic guitar is very similar in many ways to a Martin 000-28 guitar, but there are a number of noteworthy differences. First, however, we should examine the basics of this fine instrument, and of course, it is an all solid wood instrument of the highest order, just like you would expect Paul Simon to play, and just as you would expect from C.F. Martin & Co. 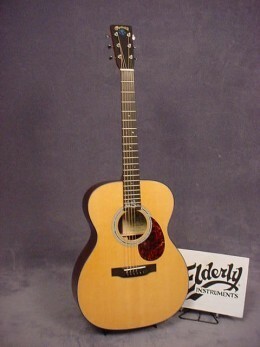 The 000 body size of this guitar is smaller than a dreadnought, and is often preferred by persons that do a lot of fingerstyle playing like Paul Simon does, but the guitar would also work very well for playing leads with a pick, as it is very similar to theEric Clapton model guitar by Martin that Eric does just that with. Paul Simon, of course, does more than just fingerpick, he is also a very aggressive and accomplished rhythm guitarist, and the East Indian rosewood back and sides of this instrument are often the tonewood of choice for discriminating rhythm guitarists. No surprise that Paul Simon would prefer a rosewood and spruce guitar. :Is the guitar X braced? Yes it is, it is hybrid X braced, Martin is calling these braces a "0001 hybrid" bracing pattern now. It is a time saving technique that is a mixture of modern and traditional Martin guitar building. What about the neck Joint? 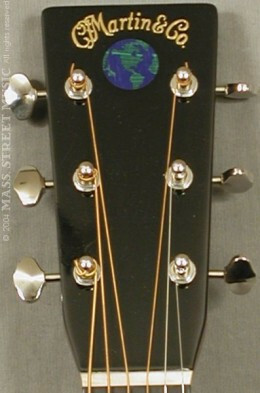 Again, the Martin PS2 features sixteen series guitar building techniques, so the neck joint of the Martin PS2 guitar is that of the Mortise/Tenon style - which takes a lot less time to make, allowing Martin to sell this guitar more reasonably to you. The guitar comes with the same limited lifetime warranty to the original owner that the most expensive Martin instruments also have.The Martin 000-28 features the classic Martin building techniques of the full high X scalloped bracing and the mahogany block dovetail neck joint, the Martin PS2 cut costs on those two construction factors, but upped the "beauty quotient" by including additional custom abalone inlay including the globe inlay on the head stock, the "45 style" abalone inlay on the rosette, and of course, the Paul Simon signature inlay on the twentieth fret.If you wish to peruse the complete set of building specification differences between this guitar and the 000-28, then I'll provide for you the links with which you can do this. The complete and official Martin PS2 specifications may be viewed here and the complete and official specifications for the more traditional Martin 000-28 can be viewed here.One major deviation between sixteen series instruments and the Martin PS2 Paul Simon guitar is that the PS2 features upscale gloss finish front and back, rather than just on the top as sixteen series guitars do, and this is only fitting for a guitar within this price range. Satin finish on the back of a guitar isn't no poor thing, but of course the gloss finish is preferable, and an artist as talented and accomplished as Paul Simon ought not to have second best of anything on a guitar with his very name on it. The second major deviation from certain sixteen series Martin instruments and this guitar is that this one features solid ebony as the wood used for the fingerboard or fret board and the bridge, and again, this is a guitar with the name of one of America's finest musician's attached to it in the abalone inlay that is so dangerous to the luthier to cut and install. Altogether a top tier instrument for anyone interested, and this guitar would make for a fine heirloom, an altogether professional instrument that can be used for any type of musical application - just as the man it was named after can and does play any kind of music he so chooses. Paul Simon, Willie Nelson, And Martin Guitars.